Last year’s donation of a portrait commission given to St. Andrew’s School’s scholarship fundraiser was won by a family with two sets of kind, smart, beautiful twin girls. Although the print included three human figures more than I had originally anticipated, the process – as well as working larger than I normally do – was rewarding, and I ended up with a varied edition. Each girl received her own proof of the print on Christmas morning, randomly choosing one of four that were each wrapped in different corners of the room. 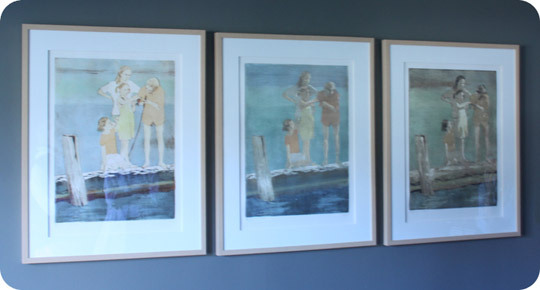 I love seeing prints displayed in multiples, and the Shermans have done a beautiful job of displaying these three together in their living room. Thanks to the Shermans for inviting me to stop by and see how a piece of my work has become part of a family’s daily life and home. This entry was posted in From the Studio, New Work on April 20, 2010 by ellenheck.